Over £200 is an awful lot to pay for a simple Blu-ray player, but Panasonic has loaded the DMP-BDT320 disc spinner with a host of extras and made it something of a streamer. Now fitted with the same Viera Connect interface that adorns its plasma and LED-backlit LCD TVs, the Panasonic DMP-BDT320 is stuffed with Netflix, Skype and BBC iPlayer, all of which are controlled by a swanky touchpad remote (more about that later). The Panasonic DMP-BDT320 isn't the brand's flagship Blu-ray deck. That honour goes to the DMP-BDT500, although for most users this is the pinnacle, features-wise. A mere 27mm in height and only 179mm deep, the Panasonic DMP-BDT320 fits nicely into an AV rack, although any distinctiveness from other components is limited to the 45-degree angled sides. Otherwise this is gloss black all the way, albeit with a slightly mottled top surface. Those with an aging AV receiver without HDMI inputs won't like the look of the Panasonic DMP-BDT320's rear, which sports just a single HDMI output. Component video outputs have also been lost on this year's batch of Blu-ray players (from all brands - thank a nervous Hollywood for that one). But analogue video remains in the form of a down-and-dirty composite video port, which is presumably for anyone with a CRT TV accidentally buying the Panasonic DMP-BDT320 thinking it's a DVD player. Audio is via either some left and right phonos or the digital optical audio out. Unless your Wi-Fi connection is flaky, the Panasonic DMP-BDT320's Ethernet LAN port will be redundant - there's a Wi-Fi module built in. So too will a second USB, which is exclusively for plugging in a Panasonic TY-CC10W Communication Camera - sold separately - to bring Skype video calling to this deck's Viera Connect smart TV interface. Although hardly vital, it's an impressive accessory that boasts four unidirectional microphones and a 1280 x 720-pixel image. More useful is Wi-Fi Direct, which makes it possible to link smartphones to the Panasonic DMP-BDT320 without the need for the broadband home network. For now it's terribly niche, but most CE devices will feature Wi-Fi Direct within a few years. Viera Connect, making its debut on Panasonic Blu-ray players this year, is oddly called 'Network Service' on the home screen. This year sees Netflix joining Acetrax to cover movie streaming. And BBC iPlayer, YouTube, Euronews, CNBC, UStream, Aupeo, PlayJam, SHOUTcast radio, DailyMotion, Picasa, Twitter and Facebook aren't far away. There's a link to a marketplace, too, although it's a slimmed-down affair that doesn't enable payment for apps. For now it's a mixture of one-trick games such as chess and poker, and mostly acts as a storage vault for apps you don't actually want to clutter up the home screen. We downloaded Penalty Shootout from the marketplace, but found it almost impossible to play the game using the trackpad remote, since numbers were needed to select an area of the goal to aim at. The Panasonic DMP-BDT320 can also indulge in home networking and digital file handling. Aside from spinning 2D and 3D Blu-ray discs, the Panasonic DMP-BDT320 manages a plethora of other formats. The usual DVD and CD purchases are no problem, but that disc tray goes further by playing AVCHD, DivX and MKV video, FLAC and MP3 music and JPEG photos. Removable media is on the menu, too, with slots for both USB flash drives and SD cards hidden behind a small flap on the player's right-hand extremity. The latter is primarily for BD Live purposes, although all flavours of SD cards up to 64GB are supported. From SD the Panasonic DMP-BDT320 claims support for JPEG photos and MPEG2/AVCHD video only, while from a USB stick we managed to play MP3 and even FLAC music, as well as AVC HD, AVI, MKV, MOV, MP4 and MPEG videos. The deck picked out some impressive detail from some MP3 and FLAC files, but didn't recognise WAV or WMA files. Over DLNA the results are poor; we were only able to play AVC HD and MOV video files, as well as MP3 and FLAC music files. 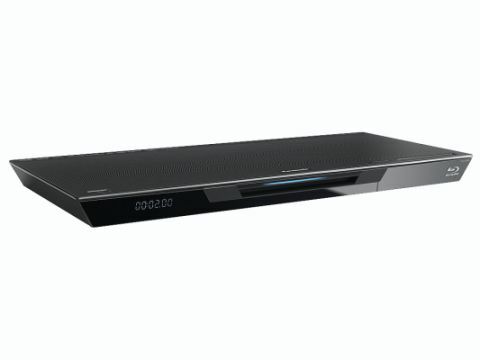 Priced at £240 in the UK and $199.99 in the US, the Panasonic DMP-BDT320 sits mid-way between its little brother the Panasonic DMP-BDT220 and the Samsung BD-D8900 in the Blu-ray player market.